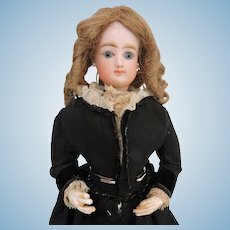 HOLIDAY PRICE! 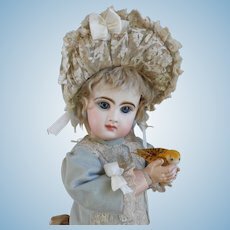 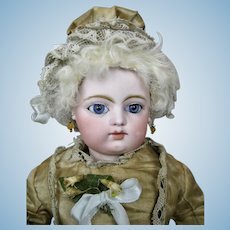 Magnificent Rare Large 28" Antique Size 13 French EJ Jumeau Bebe in Couture Outfit~A SHOWSTOPPER! 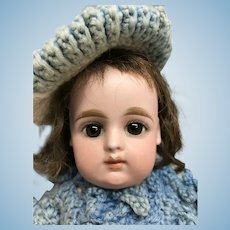 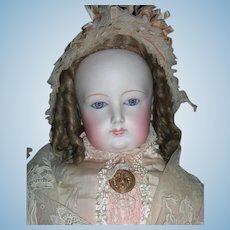 28"(70CM)EXCEPTIONAL Antique french bebe BRU circle dot , doll antique dressed. 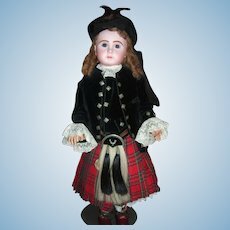 RARE Size 20 Steiner Dressed in Elaborate Antique Scottish Costume - Long Layaway! 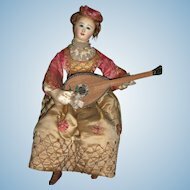 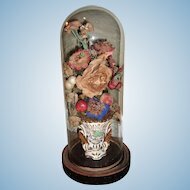 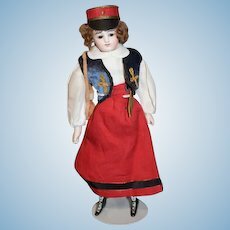 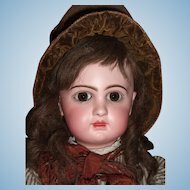 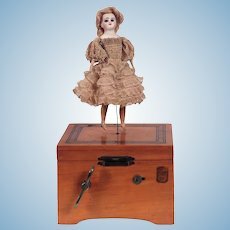 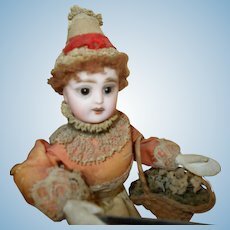 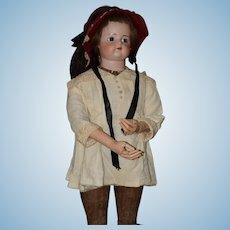 antique French mechanical musical Dancing Doll with Original Au Louvre Label music box. 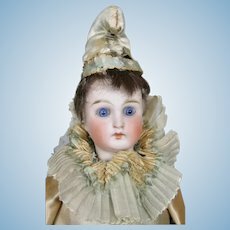 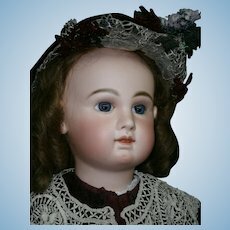 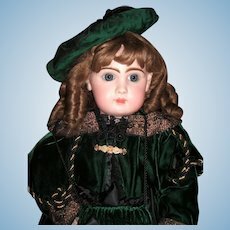 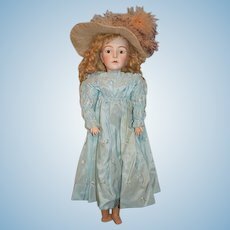 Amazing Jumeau 7..closed mouth...18,4 inches tall. 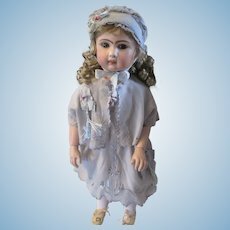 Antique Bisque French EDEN BEBE Doll Alsace w Tag! 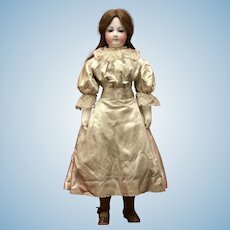 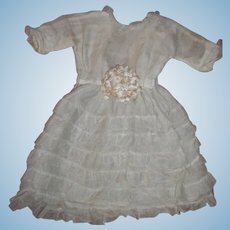 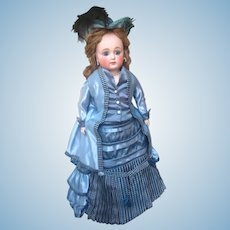 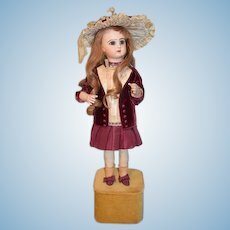 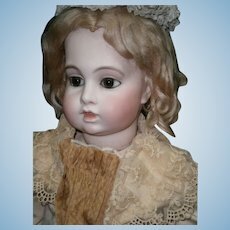 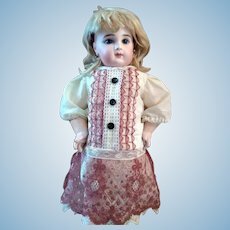 Beautiful Organdy French Antique Doll Dress for Bebe or French Fashion - layaway. 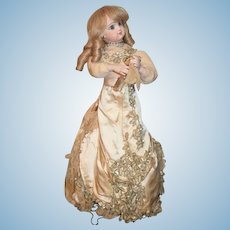 This gorgeous bebe stands 28" tall. 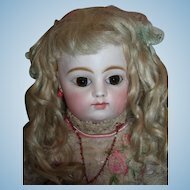 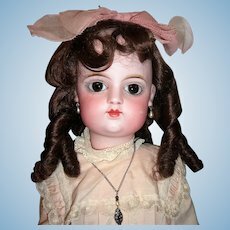 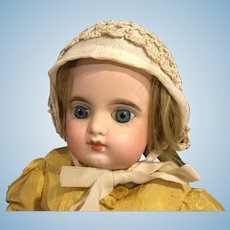 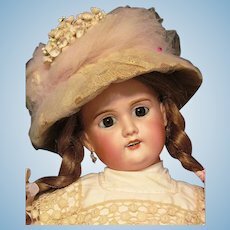 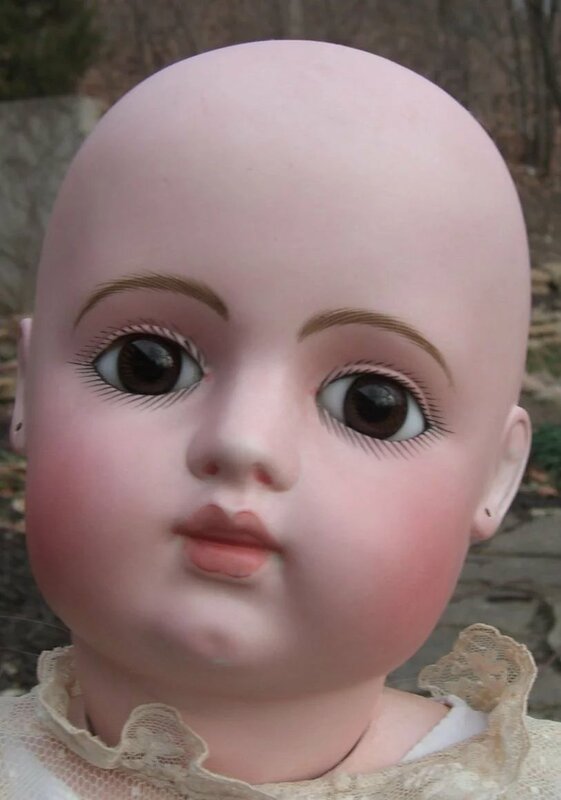 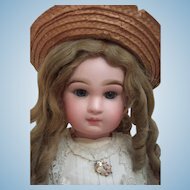 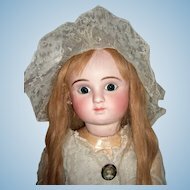 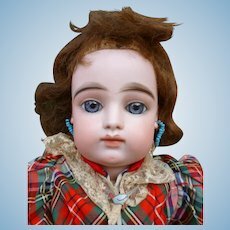 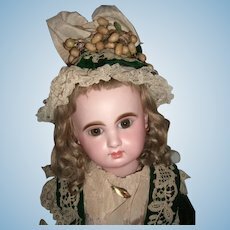 She has huge chocolate brown paperweight glass eyes and nicely painted bisque. 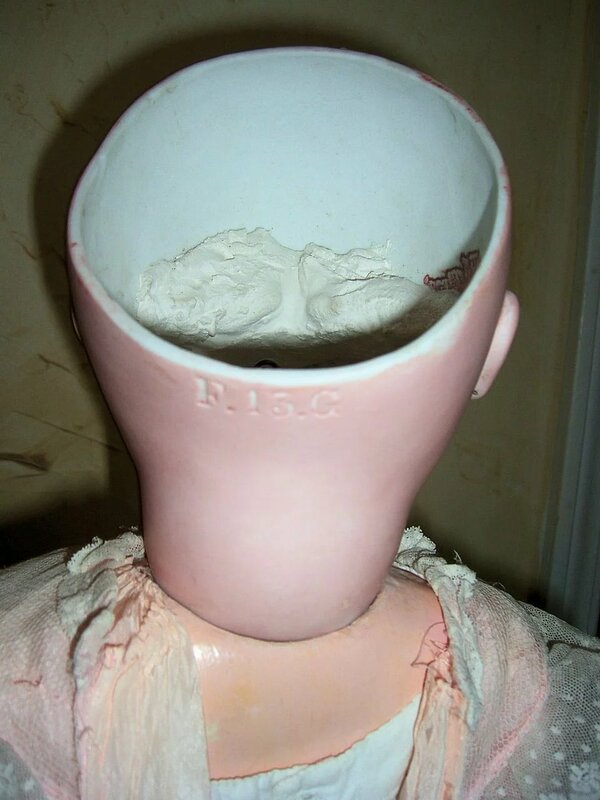 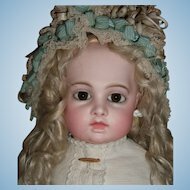 She has a closed mouth and is inscribed F.13.G on the back of her head. 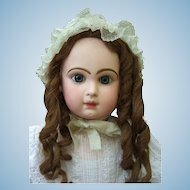 She has a light brown human hair wig over her original pate. 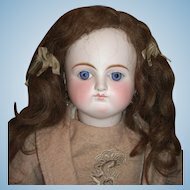 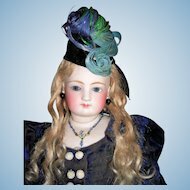 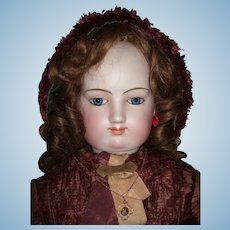 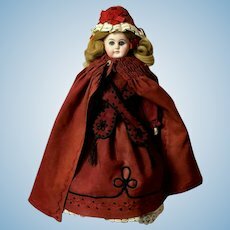 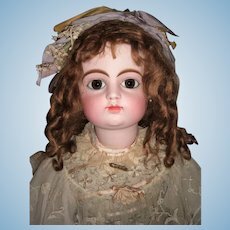 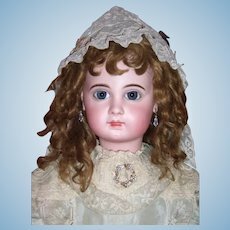 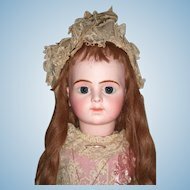 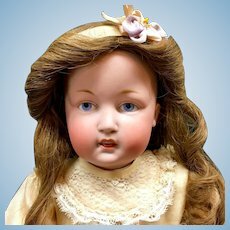 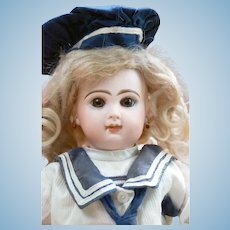 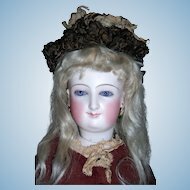 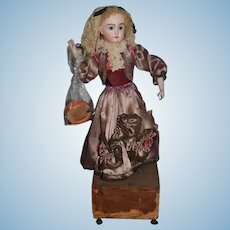 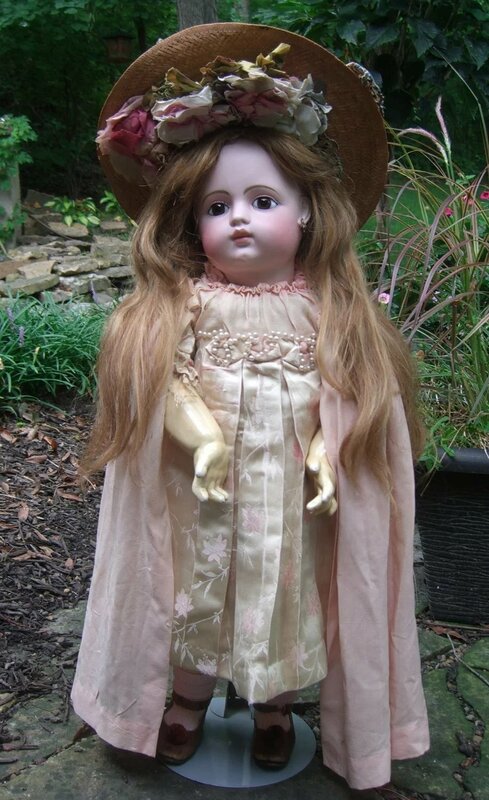 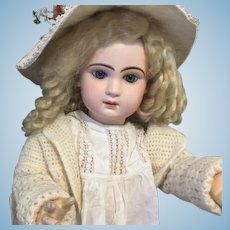 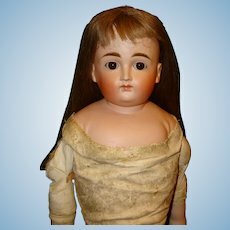 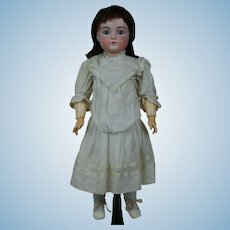 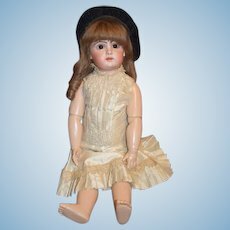 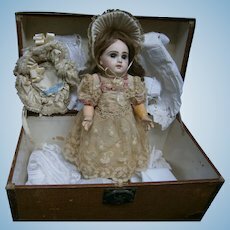 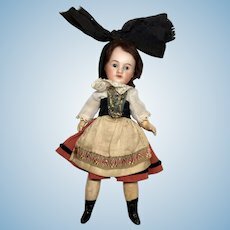 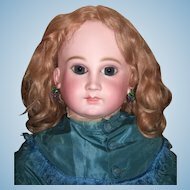 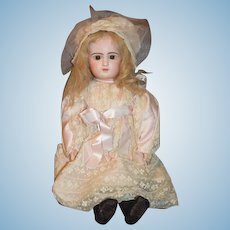 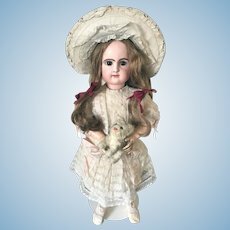 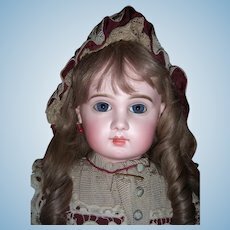 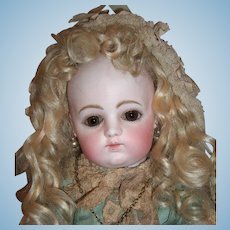 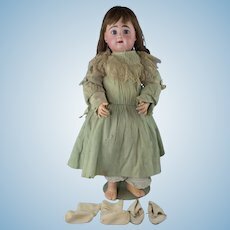 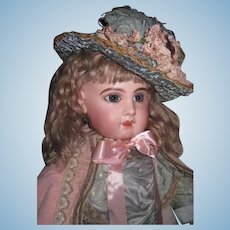 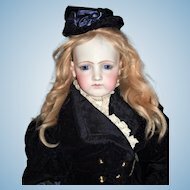 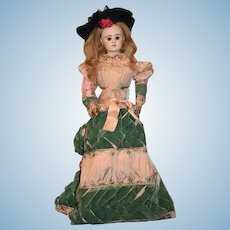 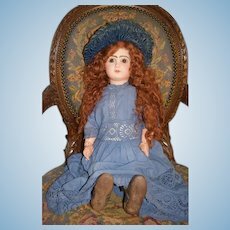 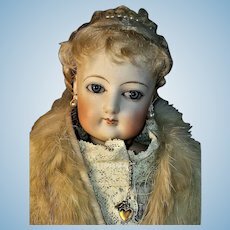 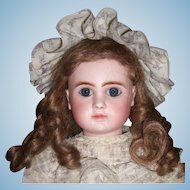 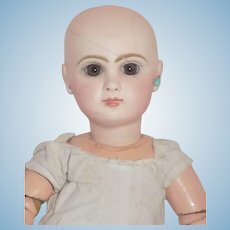 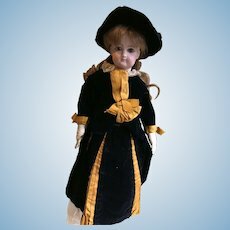 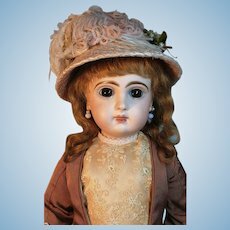 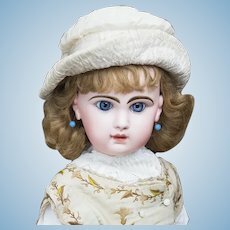 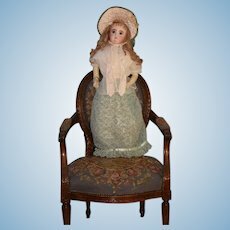 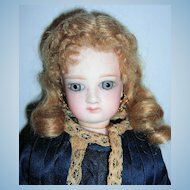 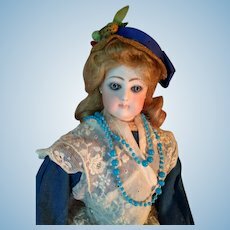 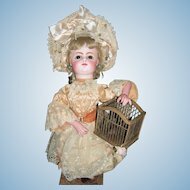 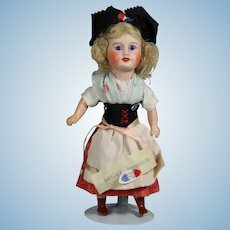 This doll is on her rare french composition ball jointed body with straight wrists that bears a MINT Gesland label. 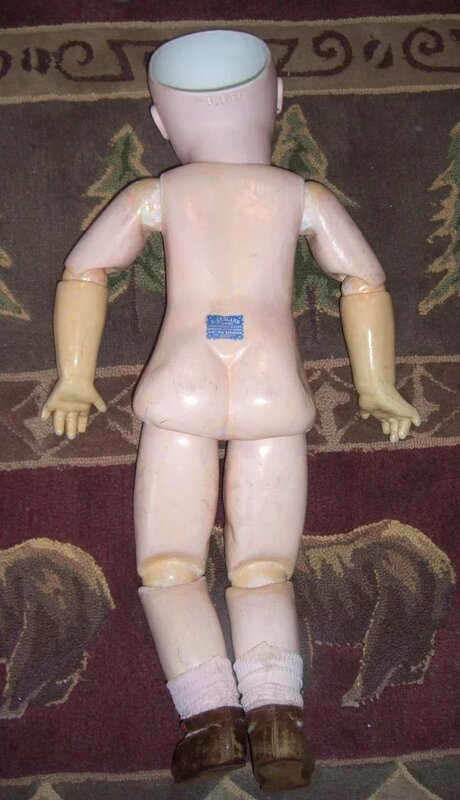 The lower arms are a different color than the rest of the doll - this could mean they were replaced or repainted (but definately correct to her). 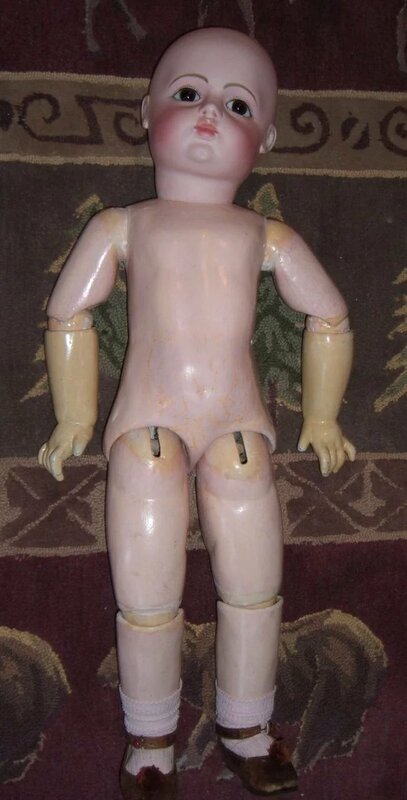 She is in wonderful condition. 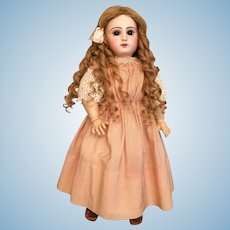 She is dressed in an amazing Jumeau made Couture antique pink silk dress with lovey pattern and pleats. 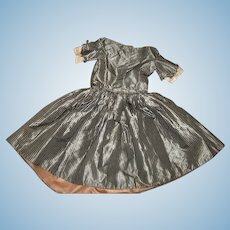 The dress is a work of art: it has a sewn on pink crepe cape and the bodice is trimmed with faux pearls along with the bank. 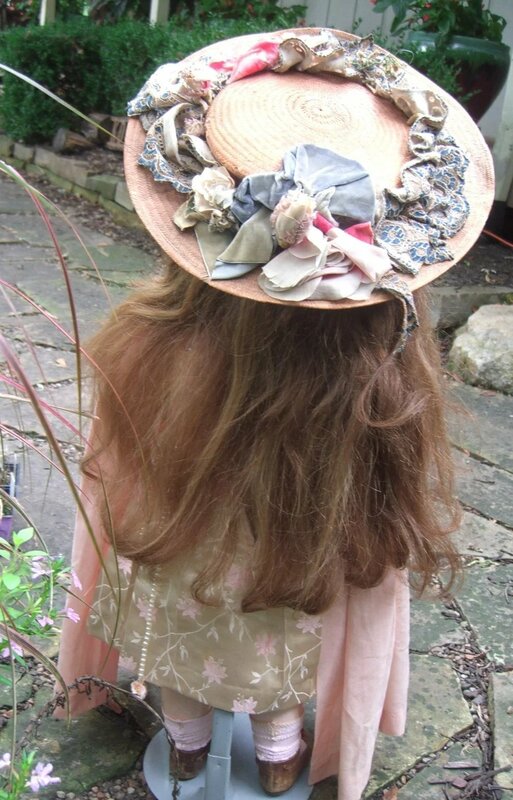 Her antique straw hat is adorned with cloth flowers and is the perfect compliment to her attire. 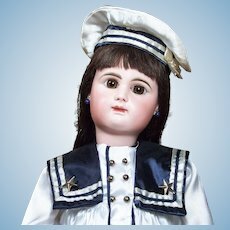 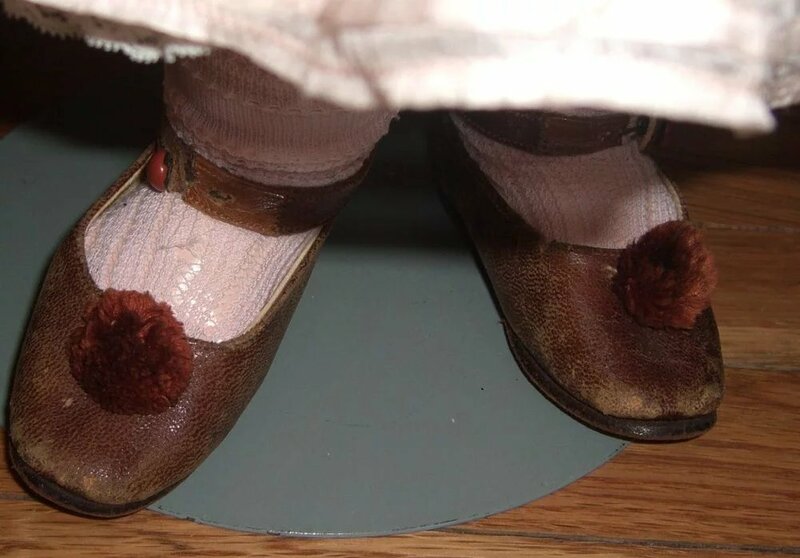 She has darling french leather shoes with pompoms, antique undergarments and socks. 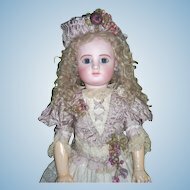 This lovely girl is available on layaway with just $400 down provided the remainder is paid in 18 monthly installments or less.